According to state television a new fire broke out this afternoon at 17.15 in western Crete in the town of Chania. In the meantime the fire around Patra is still raging. During the day two helicopters and two airplanes helped the efforts to contain the fire but the night will be difficult for both the locals and the firefighting forces. Ex prime Minister George Papandreou, an MP for Patras, visited the area. The Achaia organisation of SYRIZA has issued a press release congratulating the fire fighting forces and pointing out that the State should make sure the burnt forests retain the character of “forests” and are not turned into “urban areas” and thus become prey to various land grabbers. One of the good things we heard this morning: finally the Greek state managed to sign the documents for the sale of the 4 airbuses of the now privatised Olympic Airways. When the sale of the airline went through back in 2009 Marfin, the new owner, refused to buy them. The greek state has been paying thousands of Euros for the last three years for the airbuses’ “parking” in the Eleftherios Venizelos airport and a minimal maintenance. According to NET the price achieved today is six times lower than in 2009. Would you be optimistic about the privatizations announced by Mr. Antonis Samaras? 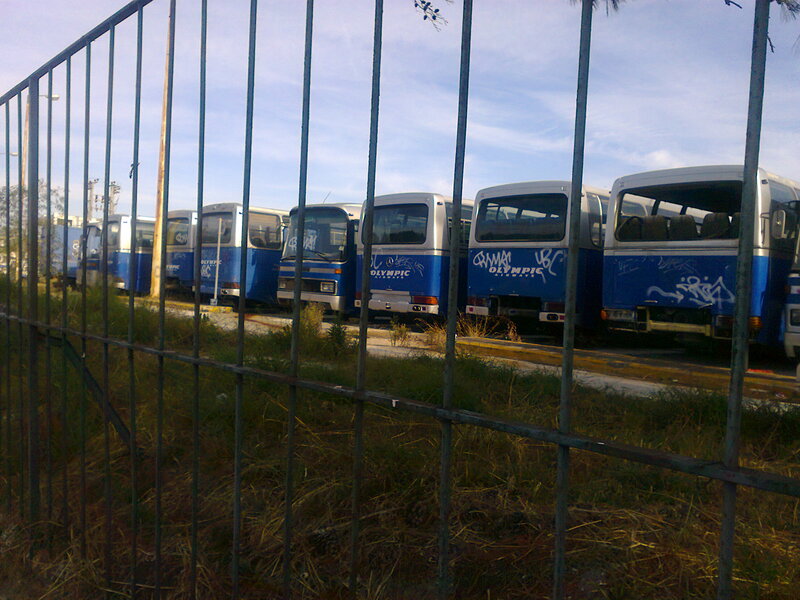 If so visit the old airport and feast your eyes on the completely wasted bus fleet of the Olympic airways. These cars were left to rot while the state pays taxis to carry pupils from villages to schools, or coaches to take pensioners on short trips.